Written on July 11, 2013 . Posted in Announcements + Updates, Foundation Studies. Nade Haley’s (Professor, Foundation Studies) “Rising” was commissioned by Artpark for it’s 40th anniversary exhibition, “40 for 40.” A wall installation created in response to Hurricane Sandy and the subsequent effects on our environment as the earth warms, “Rising” seeks to generate some understanding of the paralyzing and awesome energy produced by such events. 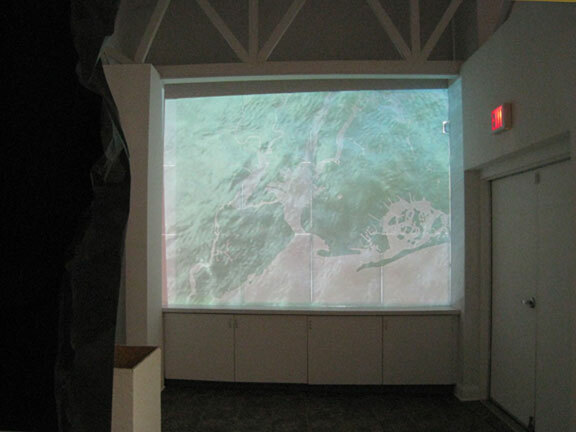 The piece is comprised of a map measuring approximately 90″ x 115″ of the New York City area most impacted by Sandy and a video taken from a ferry crisscrossing the East River. Land areas on the map are raised 1/2″ above the water level. The white on white map is divided into a gridded surface on which the video is projected. The grid functions on a number of levels, one being a means to define locations on the map. It is also a response to its site in the gallery, where windows are covered to control the amount of natural light emitted from the outside. All the components of “Rising” join to create a trancelike effect. The slow moving part of the video lulls the viewer into a state where they are at ease, but when it speeds up, creates an anxious situation. The map is not always recognizable and operates more like a backdrop while the video runs over its surface until enough time has passed and the location becomes apparent.